Amenities & Landmarks: A town green anchors the community and serves as a gathering spot for local events, like the Concerts on the Green summer series. Downtown is dotted with one-of-a-kind stores and homegrown eateries. The small-town feel comes with access to all the D.C. metro area attractions. Take a stroll down tree-lined Historic Church Street, or take a leisurely drive through Vienna’s Historic District. Visit Freeman House and Museum, originally a residence / general store built in 1859, or walk across the street to Centennial Park, home to an old restored Washington and Old Dominion caboose and bordered by the scenic Washington and Old Dominion Regional Park Trail. Economy: Software, telecommunications, internet and other high-technology industries along with its proximity to Washington, D.C. remain themajor components of the area’s economy. The nearby mass transit link to the Dulles Airport is expected toopen in 2014, driving a major commercial expansion in the nearby Tysons Corner area. It is estimated that 20,000 additional area jobs will be created as a result. Education: The town is served by Fairfax County Public Schools.Vienna is home to two high schools (Oakton and Madison), two middle schools, and six elementary schools. However, of all the schools Vienna students attend, only four public and one Catholic elementary schools are actually within the town limits: Cunningham Park Elementary School, Marshall Road Elementary School, Louise Archer Elementary School, Vienna Elementary School, and Our Lady of Good Counsel. Getting Around:A principal north-south route for bicycle travel through the Town is theWashington & Old Dominion Railroad Regional Park, commonly referred to as the “W&ODTrail.” The trail, which was constructed on the original W&OD railroad bed, runs from Arlingtonto Purcellville and is owned and operated by the Northern Virginia Regional Park Authority. The trail accommodates pedestrians, skaters, and horseback riders, as well as cyclists. The Washington Metropolitan Area Transit Authority is the principal provider of public transportationin the Vienna area, operating the Metrorail and Metrobus systems. The focal transportation facility forVienna is the Vienna/Fairfax-GMU Metrorail Station. The Vienna Station is the western terminus of Metrorail’s Orange line. Thisroute runs east along Interstate 66 through Fairfax County, Arlington County, and on to Washington, DC. The Orange Line connects at various points with the other Metroraillines serving Washington, Maryland and Northern Virginia. The Metrorail System also connects withAmtrak train service from Union Station in Washington, DC. History: The original Fairfax County Courthouse, built near the present Tysons Corner, likely marked the first European settlement in the Vienna area. Street names such as Old Courthouse Road and Lawyers Road still reflect that origin. In 1754, prominent soldier and land owner Colonel Charles Broadwater settled within the town boundaries. Broadwater’s son-in-law, John Hunter built the first recorded house there in 1767, naming it Ayr Hill (recalling his birthplace, Ayr, Scotland.) That name was subsequently applied to the tiny, developing community. The name of the town was changed in the 1850s, when a doctor named William Hendrick settled there on the condition that the town would rename itself after his hometown, Vienna, New York. Prior to the arrival of the railroad, Vienna had one main road, known as the Old Georgetown Road, that twisted and turned to avoid mud holes and rocks. The railroad reached Vienna in 1858 and provided impetus for growth into a real village. Known then as the Loudoun and Hampshire, it started at Alexandria and was planned to extend to the rich coal fields of Hampshire County, but natural barriers and the Civil War prevented the materialization of this plan. A trolley line came in 1903, furnishing hourly transportation to and from Washington, D.C. This gave way to the automobile age. The first car owned in town was Mr. Freeman’s Franklin in 1904. The speed limit was 12 mph. In 1940, Vienna was still a small, quiet, rural town with a population of 1,237 and remained virtually untouched by the metropolitan character of the nation’s capital. The town began to take on a new look in the 1950s when many businesses started to move from the old commercial section on Church Street to Maple Avenue. 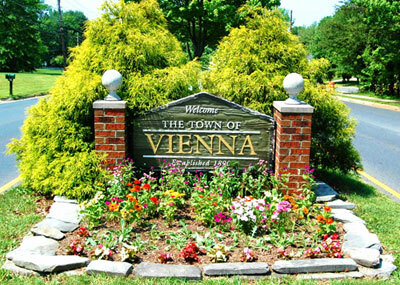 The post-World War II rush to the suburbs brought a burgeoning of population to Northern Virginia, almost 10,000 new residents to Vienna alone, their new houses blending with those of an earlier era. In 1954, the first of Vienna’s modern shopping centers was opened. More shopping centers followed in quick succession along a widened Maple Avenue in an attempt to keep up with the influx of newcomers who bought homes in the town’s new subdivisions. Older residents recall with nostalgia the Victorian homes and the maple trees that lined Maple Avenue before it was widened in 1958. Population around Vienna increased rapidly, leading to the establishment of Fairfax Hospital, the county’s first hospital, in 1961; construction of Dulles International Airport in 1962; opening of Tysons Corner Center in 1968; and opening of the Vienna Metrorail station in 1986. In town, the Vienna Community Center was dedicated in 1966, and in 1971 the Patrick Henry Library opened.